On February 7th, Jayden Paeth was walking down the sidewalk when two cars collided and he was caught in the middle. His life was almost over in a split second. “The first day we thought we were going to lose my son,” says his mom Jody Provost outside Children’s Hospital in Detroit where Jayden is going through extended treatment. “He just turned 16 two days before this. We didn’t even get to have his birthday party.” Surveillance video shows one vehicle hits another and Jayden gets hit on the sidewalk. It is too painful for his mother to watch. She’d rather look at and show you Jayden’s progress in pictures from inside the hospital. 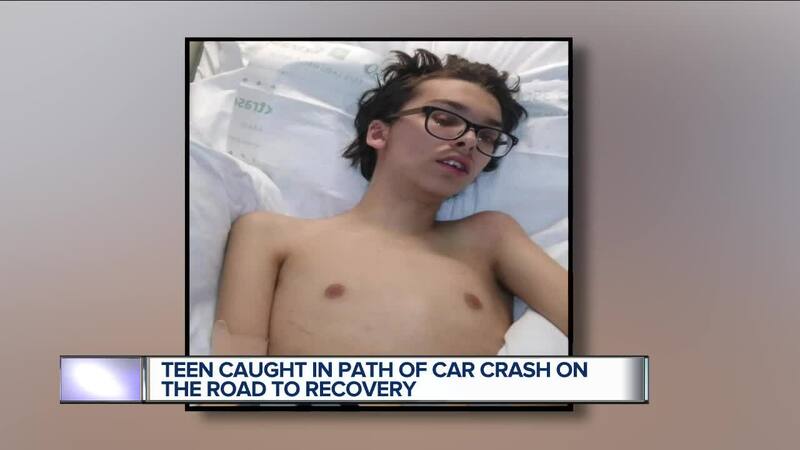 DETROIT (WXYZ) — On February 7th, Jayden Paeth was walking down the sidewalk when two cars collided and he was caught in the middle. His life was almost over in a split second. Surveillance video shows one vehicle hits another and Jayden gets hit on the sidewalk. It is too painful for his mother to watch. She’d rather look at and show you Jayden’s progress in pictures from inside the hospital. He was in intensive care and is now looking and feeling much better. He still communicates with hand signals. He’s still on a feeding tube, but is working hard to walk. “He’s starting to stand with lots of assistance. I think he’s doing amazing,” his mother says. In the surveillance video you can see one of the drivers take off. Port Huron Police would chase down and arrest 43-year-old Patrick Houle of Kimball. He’s charged with fleeing, leaving the scene and driving on a suspended license. Inside Port Huron High School students are selling fliers that say Believe in Jayden. One day coming, they hope soon, they’ll all be back together in Port Huron. Just today the family set up a GoFundMe page .